Bangor Swimming Pool is the main competition and diving pool in the region. Dating back to the sixties, parts of the building and its installations required refurbishment and upgrading. YGC were commissioned by Gwynedd Council’s Property Unit to design and manage the work. 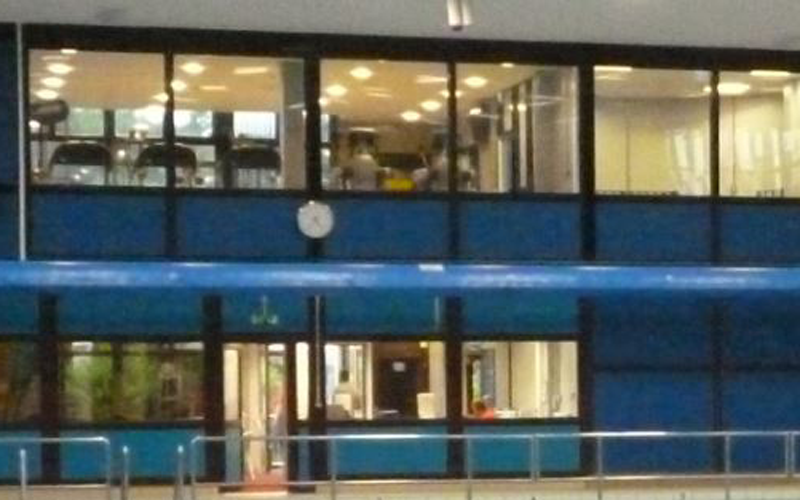 It was necessary to minimise it closure period to the public. There were different streams of funding for the project including the Authority’s repairs and maintenance budget, its energy conservation budget, and Leisure Department funds. Discussion and liaison was required with separate client representatives to ascertain their requirements and to finalise the brief. Having agreed the scope of the work, surveys were carried out and plans and specifications drawn up. Asbestos refurbishment and environmental surveys were commissioned, and Building Regulations and other consents sought. A main contractor was engaged from the Authority’s framework by electronic tendering through e-tender Wales. One of the main elements of the work was to replace the ceiling to the pool hall and to make the roof void accessible for future maintenance. Having drained down and checked the pool, its walls and floor were protected with plywood and a waterproof membrane, and a pump was installed to drain any excess water. A purposely designed birdcage scaffold was then erected in the pool hall by a NASC approved contractor. Licenced asbestos removal contractors were required to remove the suspended ceiling and insulation and to undertake a full environmental clean of the ceiling void. The remaining ceiling structure and walkways were removed, and a structural engineer engaged to assess the steelwork. New ceiling joists to engineer’s specification were installed and decked out to enable safe access for maintenance. Moisture-resistant plasterboard with an acoustic finish was then fixed to provide a new ceiling to the hall, and new LED lights to prescribed lux levels were installed. Mechanical and electrical upgrading was a substantial component of the project and its budget. The work was designed and managed by the Unit’s M & E Engineers and reducing the property’s energy consumption was one of its priorities. Extensive re-wiring work was undertaken plus the installation of energy efficient lighting and other accessories, and the fire alarm replaced. 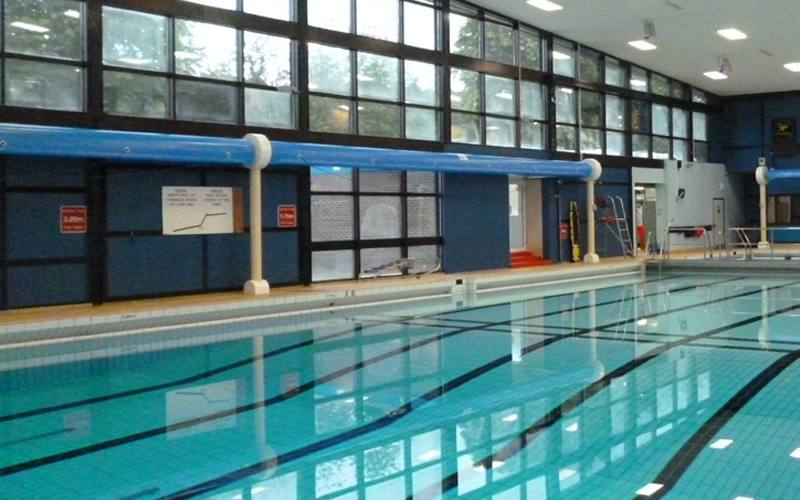 A new Poseidon ‘drowning detection system’ was installed within the pool to replace the existing. This required the input of external consultants due to its specialised nature, and an accredited diving team to assist with its installation. Mechanical work included the replacement of ductwork, provision of a new water filter and pump for the pool, and installing a new heat exchanger and air handling unit. A pool cover was also installed to conserve energy. 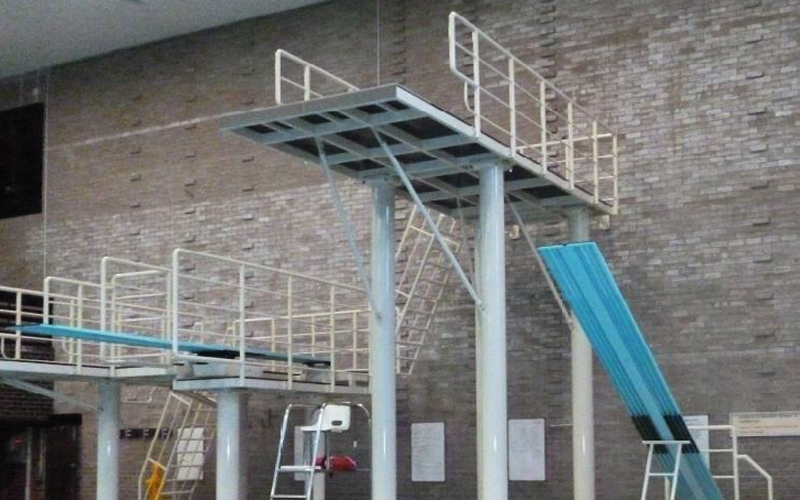 An external water flume, its internal staircase and associated plant had to be removed to be able to accommodate the pool cover. Wall openings had to be closed off and all areas affected by the removal fully restored. was redecorated internally and externally, and new signage provided throughout. An expansive Health & Safety file and O & M manual was given to the Client on completion of the works. The pool reopened to the public in August 2015.